Hi, my name is Karen and I am one of Dr. Dot's Glasgow based assistants. I am really happy to be working as part of the team. I applied for the job after reading about her team on the internet. After some chat with Dot I was auditioned by her assistant, who gave me the thumbs up and I was hired by Dot the next day. My 11 year old, guitar playing, son thinks it's pretty cool too. I also love music and massage, though I don't play, or sing, unless I am on my own! I love going to see live bands, which I do at every opportunity and at all sorts of venues. I have been running my own Holistic Therapy business for 3 years, mainly as a mobile therapist but have worked in a variety of fields e.g. within hospitals, schools, special needs, exhibitions and charities. I also run Baby massage Classes and offer therapies at local sports centers. I am qualified in Swedish Massage, Advanced Body Massage (includes Neuromuscular, Acupressure & Shiatsu Techniques), Indian Head Massage, Reiki, Hot Stone Therapy, Instructor in Baby Massage, Reflexology and Auricular Therapy (ear candling). At the moment I am studying for my Diploma in Non-Medical Nutritional Advice, which will be finished by June 2008. 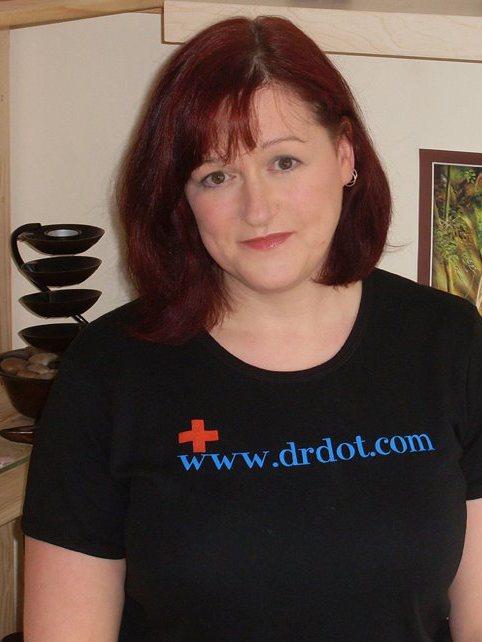 I will be taking up a Diploma course in Aromatherapy and Lymphatic Drainage from September 2008. Don’t think I will stop learning, I love it so much. My aim is to give the best possible treatment tailor made to your requirements.